What happened before Star Wars: The Force Awakens? Those events are about to be recounted in humorous fashion. This may come as a surprise to many, but we're actually getting a prequel TV series that reveals the events leading up to the destruction of the Starkiller Base. Though be warned, we're not sure how accurately these events are being depicted. Disney XD has released the first clip from this series of shorts. It's called LEGO Star Wars: The Resistance Rises. And the first episode is titled Poe to the Rescue. The animated series will feature popular heroes and villains from Star Wars: The Force Awakens. While we'll have to wait for the premiere on Monday, February 15 (8:00 p.m. EST) on Disney XD, this 90 second clip gives us a good idea of what we can expect to see. Poe to the Rescue kicks off LEGO Star Wars: The Resistance Rises in grand fashion. This series of all-new animated shorts will take place prior to the First Order's attack on Jakku and tells never-before-told stories from across the universe. Characters who will be appearing in the show include Kylo Ren, Han Solo, Finn, Rey, BB-8, Maz Kanata and many more. It is not yet clear if the original cast of Star Wars: The Force Awakens is returning to reprise their characters, but it sure sounds like it. Related: Watch the Lego Star Wars: Droid Tales Panel Live Right Now! Premiering immediately after Disney XD's highly anticipated Gravity Falls finale, this first short follows Resistance pilot Poe Dameron as he comes to the aid of Admiral Ackbar who is being held captive by Captain Phasma. Kylo Ren, C-3PO and BB-8 will also appear. No other upcoming episode details have been released at this time, and it isn't known how often new episodes will debut. This news comes shortly after Disney XD announced LEGO Star Wars: The Freemaker Adventures, an all-new animated television series scheduled to debut this summer on Disney XD in the U.S. The fun-filled adventure comedy series will introduce all-new heroes and villains in exciting adventures with many familiar Star Wars characters. Told in the whimsically-charged style that audiences have come to expect from LEGO Star Wars entertainment, the series stars the Freemakers, a family of scavengers who build and sell starships from the scoured debris of space battles strewn throughout the galaxy. 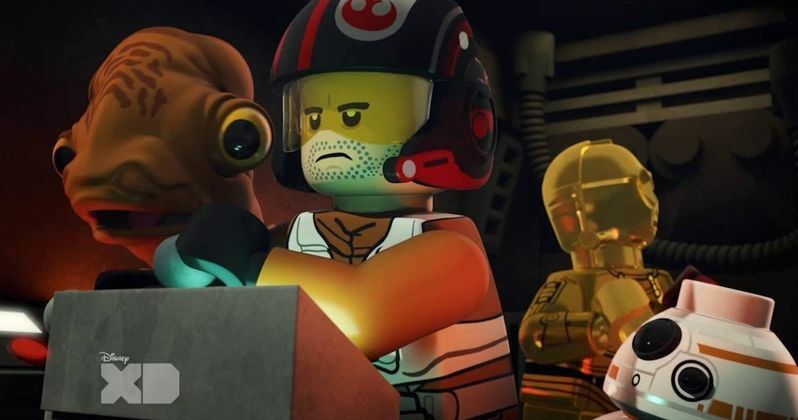 Whole we await the arrival of these two exciting Star Wars TV shows, check out the first clip from LEGO Star Wars: The Resistance Rises.